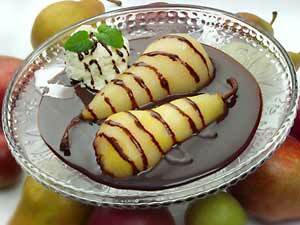 Pear and chocolate combinations have always inspired both chefs and gourmets. A classic! Belle Hélène pears are certainly a classic in the field. La scena musicale suggests two ways of making this recipe: a really simple version for weekdays or to impress your unexpected guests, and another more subtle and elaborate version designed for great occasions. Place halved pears in a fruit dish. Place a ball of ice cream in the cavity. 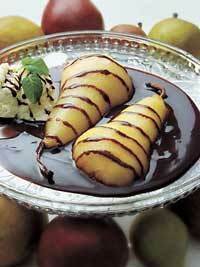 Cover with chocolate sauce. You may garnish with a wafer biscuit or almond strips. Pears: To poach the pears place all of the ingredients except for the pears into a thick-bottomed saucepan. Bring to a boil while stirring from time to time to fully dissolve the sugar. Add the peeled pears (they can be preserved whole or sliced in two and cored). Poach for up to 20 minutes depending on the firmness of the pear. Remove the pears from the liquid and refrigerate (at least two hours or until required). The liquid may be frozen and reused (remove the vanilla pod and cinnamon stick). Sorbet: Press the two limes and filter the juice. Peel and dice the pears. Add the lime juice. Melt the sugar in 150 ml of water. As soon as it boils, remove the syrup from the heat, add the vanilla, let cool and incorporate the pears. Allow to freeze into a sorbet in an ice cream maker (see the time requirements in the instruction manual). Chocolate sauce: Bring the cream, alcohol and sugar to a boil. Remove from the heat adding the chocolate all at once. Cover. After 2 or 3 minutes stir the chocolate until it becomes smooth. The sauce may be kept in a refrigerator for a few days. Then it's simply a case of warming it up (adding a few drops of cream if it has thickened too much). Present in the same way as the simple variation: first the pear, the sorbet and smother in sauce. It is said that this recipe was invented in Paris to mark the première of the operetta La Belle Hélène by Jacques Offenbach on December 17th 1864. After first being a cellist, then a conductor, the composer opened his own theatre, the Bouffes-Parisiens, in 1855. The work's memorable première, however, actually took place at the Paris Théâtre des Variétés. Henri Meilhac and Ludovic Halévy- the very man who created the libretto for Docteur Miracle (see La cena musicale in the February 2002 issue)- wrote the nearly 100 librettos of Offenbach's operettas. The pair really had a field day adapting this ancient Greek story, many times told. Helen, the wife of the overly serious king Menelas of Sparta, laments the passing of passionate love in the first act in the aria "Divine love, ardent flame." She heads to the temple with the mourners. Upon leaving the temple, she is fatally struck by the beauty of handsome Paris, son of Priam, king of Troy disguised as a shepherd. With the help of the grand priest Calchas, Paris hides in Helen's room. Helen spurns his advances, but Paris promises to seduce her through trickery as he leaves her lodgings. Helen is more troubled than she lets on as she invokes this "Paris whom she avoids, this Paris that she adores" in her dreams. A slave appears (Paris in disguise) and sings the duet "Heaven sent." The dream ends brutally when Menelas, the husband, finds them as he returns from Crete. Helen protests her innocence, explaining that she thought she was dreaming. To calm the people's anger and that of Venus, king Menelas proposes a pilgrimage to Cythere for Helen. Venus's great augury appears (Paris once again) offering to come with her, signing softly to her "I am Paris, the naive shepherd who loves you." For a few seconds, she puts on a show of resistance and then embarks with him for the journey to Troy. La Belle Hélène was not merely a historical reconstruction of the story of Helen of Troy. The operetta was also a biting satire of the high society revolving around Napoleon III. The scene in the first act, which describes an absurd game of charades (naturally won by Paris), was a direct transcription of the parlour games constantly played by the court. The third act takes place on the seashore, one of the emperor's favourite holiday destinations. Offenbach also parodied composers. The parade of kings in Act I is done to Wagner's TannhaŸser tournament music and in the last act, the Agamemnon, Calchas and Menelas trio is a hardly modified patriotic piece from Rossini's William Tell. The mockery is complete when Paris, dressed as a priest, starts yodelling. Offenbach offers us here a truculent and colourful work true to the Parisian spirit of the Second Empire. For listening: Marc Minkowsky and the soloists of the 2001 production presented at the Théâtre du Châtelet, a tremendous popular success of the last Paris season, just released a CD of the work.